The Hoosiers are heading out on the road to mark the 10th anniversary of their debut album and will playing a series of gigs in the region. 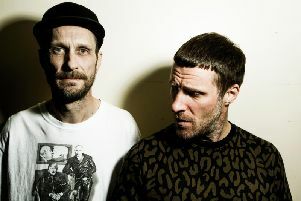 In 2007, the band exploded on an unsuspecting public with their debut album, The Trick To Life, which topped the album charts and spawned the indie-pop classics Worried About Ray and Goodbye Mr A – both of which still pack out indie dance floors a decade later. Never released on vinyl, the band will be selling a new limited edition vinyl pressing and expanded 2CD edition of their debut as part of a huge 27 date tour which will also see them play the album in its entirety. The multi-platinum success of their debut raised huge expectations for its follow-up, not least at The Hoosiers’ record label. The prophetically titled The Illusion of Safety was, all the band agree, a troubled project from the start. Singer Irwin Sparkes, said: “The word ‘hit’ is substituted for ‘good’. There’s an art to writing under those conditions, but it wasn’t one that worked for us. Third LP The News From Nowhere, released in 2014, was a return to form along with 2015’s The Secret Service, both self-released after the above troubles with labels. Irwin added: “Doing it on our own terms and actually having a proper say in it, felt wonderful. The Hoosiers play MK11 in Milton Keynes on October 1, the Kasbah in Coventry on October 7, the O2 Academy in Leicester on October 17.